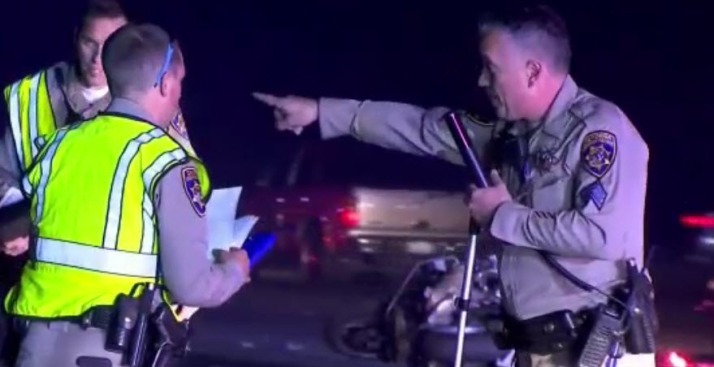 A female driver was arrested on suspicion of driving under the influence Monday night after she hit a truck that partially landed on top of a California Highway Patrol motorcycle officer who was on the side of Highway 4 in Concord assisting with another wreck, according to the CHP. The officer was hospitalized with major injuries, but those injuries are not considered life-threatening, the CHP said. The crash was reported at 6:15 p.m. on eastbound Highway 4, between Highway 242 and Port Chicago Highway. CHP also issued a Sig Alert due to the crash and investigation, which shut down the No. 1 and 2 lanes of the highway. The CHP said the officer was taking a report on the freeway for a two-car collision when a Chevrolet TrailBlazer driven by Tammy Peggy Louise Walker of Pittsburg came along and crashed into the officer's motorcycle and then a pickup truck, launching the vehicle and causing it to land on the officer. The officer — a nine-year veteran with the Contra Costa County CHP Division and a Marine Corps veteran — may have broken both of his legs, according to the CHP. Witnesses said he is lucky to be alive. Art Romay was one of the drivers involved in the massive wreck. He and others helped rescue the CHP officer. "I lifted the car off the ground, but in this gravel, it made my feet slip," Romay said. "So it kinda fell back on him. But thankfully a couple of other guys came by, and we were able to get the car off the officer." The CHP said the officer may have suffered a broken leg among other injuries, but he was expected to survive. A shaken up Edgar Martinez was in the parked SUV that was hit from behind and landed on the CHP officer. "I don’t know what happened," he said. "The next minute, I see the officer under my truck. ... He was conscious, but it was bad." Walker was taken to a local hospital, treated and released before being booked into the Martinez Detention Facility, according to the CHP. Her charges include two counts of felony DUI causing great bodily injury to another person while driving under the influence, vehicular reckless driving causing bodily injury, assault on a peace officer causing great bodily injury, and driving on a suspended driver's license for a prior DUI conviction and causing great bodily injury to another person, according to the CHP. "Enough is enough is an understatement," CHP spokesman Officer Brandon Correia said. "When is it going to stop with the DUI impaired driving? It’s 2018. Take some responsibility for your actions. This is ridiculous." The collision also pushed the officer's parked motorcycle into traffic lanes, causing two other cars to collide with each other. The incident is still under investigation. Anyone with information is asked to contact the CHP at 925-646-4980. NBC Bay Area's Jodi Hernandez contributed to this report.